Only 2 King Ranch 4WD Crew Cab 8' Box models left in stock! Nav System, Heated/Cooled Leather Seats. Ruby Red Metallic Tinted Clearcoat with Stone Gray exterior and Java interior, King Ranch trim. CLICK NOW! Leather Seats, Navigation System, Four Wheel Drive, Heated Front Seat(s), Cooled Front Seat(s), Back-Up Camera, Premium Sound System, Satellite Radio, Auxiliary Audio Input, Telematics, Tow Hitch, Aluminum Wheels, Remote Engine Start, Multi-Zone A/C, WiFi Hotspot. MP3 Player, Privacy Glass, Keyless Entry, Steering Wheel Audio Controls, Heated Mirrors. 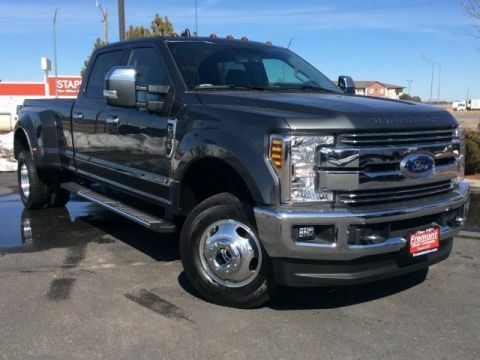 ENGINE: 6.7L 4V OHV POWER STROKE V8 TURBO DIESEL B20: manual push-button engine-exhaust braking and intelligent oil-life monitor, 3.55 Axle Ratio, Extra Heavy-Duty 220 Amp Alternator, Dual 78-AH 750 CCA Batteries, 48 Gallon Fuel Tank, CHROME PACKAGE: 2 front chrome tow hooks and chrome rear tailgate applique, Unique Chrome Mirror Caps, 6 Angular Chrome Step Bars, Chrome Front & Rear Bumpers, Body-Color Door Handles w/Chrome Insert, Chrome Exhaust Tip, POWER-DEPLOYABLE RUNNING BOARDS: Front Splash Guards/Mud Flaps (Pre-Installed), ADAPTIVE CRUISE CONTROL & COLLISION WARNING: brake support, TOUGH BED SPRAY-IN BEDLINER: tailgate-guard, black box bed tie-down hooks and black bed attachment bolts, RUBY RED METALLIC TINTED CLEARCOAT, REAR CHMSL CAMERA: Display in center stack screen, LED Center High-Mounted Stop Lamp (CHMSL) w/cargo light and rear video camera, ORDER CODE 720A, TRANSMISSION: TORQSHIFT 6-SPEED AUTOMATIC: (6R140), SelectShift. 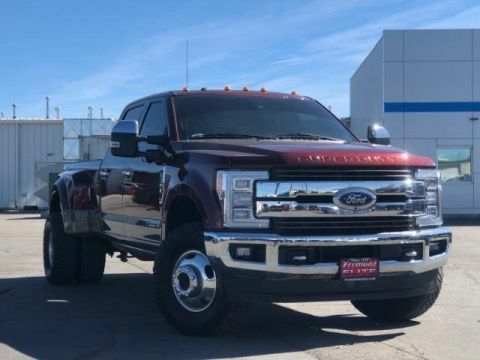 Ford King Ranch with Ruby Red Metallic Tinted Clearcoat with Stone Gray exterior and Java interior features a 8 Cylinder Engine with 450 HP at 2800 RPM*.